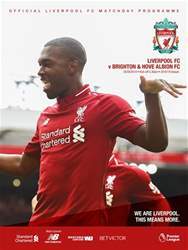 Jürgen Klopp, Jordan Henderson, Xherdan Shaqiri, Fabinho, Andy Robertson and Jan Molby all feature in the second official matchday programme of the season. The manager and captain both preview the visit of Brighton in the respective columns, also sharing a show of appreciation for the Reds' travelling support last time out at Selhurst Park. Take our home and away pre-match quiz as well as our Kop Kids teasers, and a trip down memory lane to when Luis Suarez netted an FA Cup goal against the Seagulls and when Great Dane Molby joined the club in 1984.